With this ongoing discussion about car ramps in the discussion forums, we thought we would share another solution we recently discovered for assisting tripawds into and out of vehicles. Pet Loader® is the safe way to get dogs into your car, SUV, van, truck, trailer, or camper. 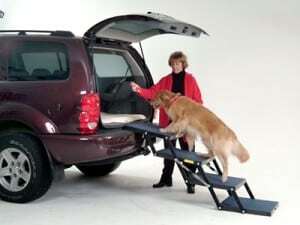 Save on Pet Loader Car Steps at Amazon! 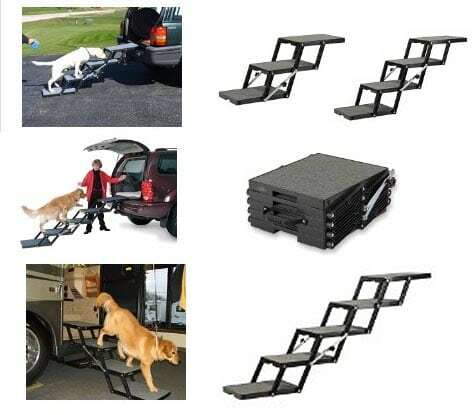 Wider and more stable than a ramp, Pet Loader’s lower angle of ascent/decent and greater traction eliminates the fear man dog’s have about entering a vehicle or using a ramp. Pet Loader car steps lightweight and fold down to a mere 7-1/4” high for easy portability and storage. Tripawds, elderly dogs, and handicapped pets will especially appreciate Pet Loader’s adjustable incline. Most dogs will instinctively know how to use the Pet Loader steps as opposed to becoming familiar with using a new ramp. With its accordion fold and built-in hand holds, Pet Loader is easy to pick up and transfer to another vehicle, or store. Weighing only 21 pounds, Pet Loader folds to just 22” long, 18” wide and an amazingly short 7.5” high, small enough to fit in the under-the-seat compartment of many vans. Pet Loader is available in three styles with various step counts. Visit PetLoader.com for complete details, order information and a demonstration video. This solution is ideal for SUVs, trucks, and other high step vehicles. An optional 5th step is available for exceptionally high trucks. Shop Amazon to Save on Pet Loader Car Steps! Do you have a favorite pet product you would like us to review? Would you like to write a testimonial or product review of your own? Contact Tripawds Today! Thanks for asking! You may get better feedback from members by posting in the forums. All we can say is we never had any returns of the Pet Loader, when we sold them. The Otto Step may be another option depending on your vehicle. If you just need a little help, a good harness may do the trick. My girl Angel is not a tripawd but has some mobility issues. Your site is so incredibly comprehensive and helpful! It has veen a great aid to me in researching snd deciding upon assistsnce tools for her. Kudos to you! Please keep up the good work!!! I know you are helping so many tripawds, other fur people and their humans in continuing and/or create a grest quality of life. Just fabulous! You are so kind Amy, thank you for writing. All the best to you and Angel in your journey!